THE NO-HOLDS-BARRED GUIDE TO BUILDING WINNING BRANDS! POWERFUL LESSONS FROM GREAT BRANDS: RED BULL, APPLE, FCUK, AND MANY MORE! FOR EVERY DECISION-MAKER AND STRATEGIST, "INSIDE AND OUTSIDE MARKETING!" Your brand is your most powerful asset. You "need "to build it. But you "don't "need all the idiocy that usually goes with brand-building: the hype, jargon, pomposity, arrogance, hand-waving, wasted time, and wasted money. You need straight answers you can use. "You need this book. "Andy Milligan and Jon Edge show how to build your brand "right, "even if you've never done it before. You'll learn exactly what goes into an effective brand strategy and architecture...what matters and what "doesn't. "..how to use research (and how "not "to)...how to get great work from your agencies...how to quantify your brand's value...and when to break the rules. 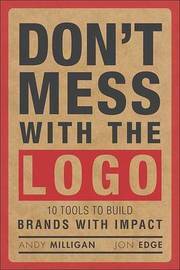 Fast, practical, and feisty, this book will help you ferret out branding nonsense, wherever it comes from, and "get results!"